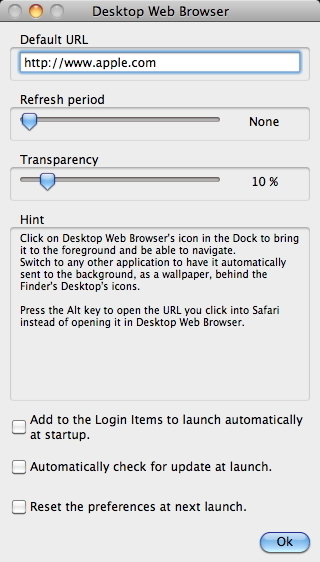 Display webpages directly on the desktop of the Finder. Is there a better alternative to Desktop Web Browser? Is Desktop Web Browser really the best app in Browsers category? Will Desktop Web Browser work good on macOS 10.13.4? Desktop Web Browser allows you to navigate on the Internet and to display webpages directly on the desktop of the Finder. You can navigate on the Internet directly on the desktop of the Finder. You can set the URL of the webpage loaded by default at start. You can set the transparency of the browser to see your original desktop picture underneath. You can set the refresh period of the browser if you want to automatically refresh the webpage periodically. You just need to press the Alt key to interact with the background browser. A full recompilation has been made to be compatible with High Sierra, and as Universal Binary to keep being compatible with both old (PowerPC) Macs and recent (Intel) Macs. Desktop Web Browser needs a rating. Be the first to rate this app and get the discussion started! You just need to press the Alt-Shift key combination to open the links into Safari. It is available in English, French, German, Polish, Russian, and many other languages. Under Mac OS 10.13 High Sierra, if you're launching the Application for the first time, Mac OS' GateKeeper (which you can configure in the "System Preferences") will refuse to launch it because you've not downloaded it from the Mac App Store (but from our website). In this case, instead of double-clicking on it, all you have to do is to right-click on the Application's icon, and then select the "Open" menu. A message will appear in which you'll be able to confirm that you want to launch the Application (even if it was not downloaded from the Mac App Store from an Identified Developer).